Figure: The circular buffer (for someone known as ring or cyclic buffer). The circular_buffer is a STL compliant container. It is a kind of sequence similar to std::list or std::deque. It supports random access iterators, constant time insert and erase operations at the beginning or the end of the buffer and interoperability with std algorithms. The circular_buffer is especially designed to provide fixed capacity storage. When its capacity is exhausted, newly inserted elements will cause elements either at the beginning or end of the buffer (depending on what insert operation is used) to be overwritten. The circular_buffer only allocates memory when created, when the capacity is adjusted explicitly, or as necessary to accommodate resizing or assign operations. On the other hand, there is also a circular_buffer_space_optimized available. It is an adaptor of the circular_buffer which does not allocate memory at once when created, rather it allocates memory as needed. // Create a circular buffer with a capacity for 3 integers. // Insert some elements into the buffer. // elements will overwrite the front-most elements. cb.push_back(4);  // Overwrite 1 with 4.
cb.push_back(5);  // Overwrite 2 with 5. // The buffer now contains 3, 4 and 5. // Elements can be popped from either the front or the back. cb.pop_back();  // 5 is removed. cb.pop_front(); // 3 is removed. Maximum efficiency for envisaged applications. Suitable for general purpose use. The behaviour of the buffer as intuitive as possible. Use of fixed memory and no implicit or unexpected memory allocation. Fast constant-time insertion and removal of elements from the front and back. Fast constant-time random access of elements. Suitability for real-time and performance critical applications. Storage of the most recently received samples, overwriting the oldest as new samples arrive. As an underlying container for a bounded buffer (see the Bounded Buffer Example). A kind of cache storing a specified number of last inserted elements. Efficient fixed capacity FIFO (First In, First Out) or LIFO (Last In, First Out) queue which removes the oldest (inserted as first) elements when full. The thread-safety of the circular_buffer is the same as the thread-safety of containers in most STL implementations. This means the circular_buffer is not thread-safe. The thread-safety is guarantied only in the sense that simultaneous accesses to distinct instances of the circular_buffer are safe, and simultaneous read accesses to a shared circular_buffer are safe. Overwrite operation occurs when an element is inserted into a full circular_buffer - the old element is being overwritten by the new one. There was a discussion what exactly "overwriting of an element" means during the formal review. It may be either a destruction of the original element and a consequent inplace construction of a new element or it may be an assignment of a new element into an old one. The circular_buffer implements assignment because it is more effective. From the point of business logic of a stored element, the destruction/construction operation and assignment usually mean the same. However, in very rare cases (if in any) they may differ. If there is a requirement for elements to be destructed/constructed instead of being assigned, consider implementing a wrapper of the element which would implement the assign operator, and store the wrappers instead. It is necessary to note that storing such wrappers has a drawback. The destruction/construction will be invoked on every assignment of the wrapper - not only when a wrapper is being overwritten (when the buffer is full) but also when the stored wrappers are being shifted (e.g. as a result of insertion into the middle of container). Inform the data source to wait until there is room in the buffer (e.g. by throwing an overflow exception). If the oldest data is the most important, ignore new data from the source until there is room in the buffer again. If the latest data is the most important, write over the oldest data. Let the producer to be responsible for checking the size of the buffer prior writing into it. It is apparent that the circular_buffer implements the third option. But it may be less apparent it does not implement any other option - especially the first two. One can get an impression that the circular_buffer should implement first three options and offer a mechanism of choosing among them. This impression is wrong. The circular_buffer was designed and optimized to be circular (which means overwriting the oldest data when full). If such a controlling mechanism had been enabled, it would just complicate the matters and the usage of the circular_buffer would be probably less straightforward. Moreover, the first two options (and the fourth option as well) do not require the buffer to be circular at all. If there is a need for the first or second option, consider implementing an adaptor of e.g. std::vector. In this case the circular_buffer is not suitable for adapting, because, in contrary to std::vector, it bears an overhead for its circular behaviour. It would introduce performance overhead. No other std container implements it this way. It is considered to be a bug to read or remove an element (e.g. by calling front() or pop_back()) from an empty std container and from an empty circular_buffer as well. The data consumer has to test if the container is not empty before reading/removing from it. However, when reading from the circular_buffer, there is an option to rely on the at() method which throws an exception when the index is out of range. #define BOOST_CB_DISABLE_DEBUG // The Debug Support has to be disabled, otherwise the code produces a runtime error. The iterator does not point to the original element any more (and is considered to be invalid from the "strict" point of view) but it still points to the same valid place in the memory. This "soft" definition of iterator invalidation is supported by the circular_buffer but should be considered as an implementation detail rather than a full-fledged feature. The rules when the iterator is still valid can be inferred from the code in soft_iterator_invalidation.cpp. While internals of a circular_buffer are circular, iterators are not. Iterators of a circular_buffer are only valid for the range [begin(), end()]. E.g. iterators (begin() - 1) and (end() + 1) are invalid. In order to help a programmer to avoid and find common bugs, the circular_buffer contains a kind of debug support. The circular_buffer maintains a list of valid iterators. As soon as any element gets destroyed all iterators pointing to this element are removed from this list and explicitly invalidated (an invalidation flag is set). The debug support also consists of many assertions (BOOST_ASSERT macros) which ensure the circular_buffer and its iterators are used in the correct manner at runtime. In case an invalid iterator is used the assertion will report an error. The connection of explicit iterator invalidation and assertions makes a very robust debug technique which catches most of the errors. Moreover, the uninitialized memory allocated by circular_buffer is filled with the value 0xcc in the debug mode. This can help the programmer when debugging the code to recognize the initialized memory from the uninitialized. For details refer the source code. The debug support is enabled only in the debug mode (when the NDEBUG is not defined). It can also be explicitly disabled (only for circular_buffer) by defining BOOST_CB_DISABLE_DEBUG macro. The circular_buffer is compatible with the Boost Interprocess library used for interprocess communication. Considering that the circular_buffer's debug support relies on 'raw' pointers - which is not permited by the Interprocess library - the code has to compiled with -DBOOST_CB_DISABLE_DEBUG or -DNDEBUG (which disables the Debug Support). Not doing that will cause the compilation to fail. The following example includes various usage of the circular_buffer. The circular_buffer has a capacity of three int. Therefore, the size of the buffer will not exceed three. The std::accumulate algorithm evaluates the sum of the stored elements. The semantics of the circular_buffer can be inferred from the assertions. The bounded buffer is normally used in a producer-consumer mode when producer threads produce items and store them in the container and consumer threads remove these items and process them. The bounded buffer has to guarantee that producers do not insert items into the container when the container is full, that consumers do not try to remove items when the container is empty, and that each produced item is consumed by exactly one consumer. The example below shows how the circular_buffer can be utilized as an underlying container of the bounded buffer. The bounded_buffer relies on Boost Threads and Boost Bind libraries and Boost call_traits utility. The push_front() method is called by the producer thread in order to insert a new item into the buffer. The method locks the mutex and waits until there is a space for the new item. (The mutex is unlocked during the waiting stage and has to be regained when the condition is met.) If there is a space in the buffer available, the execution continues and the method inserts the item at the end of the circular_buffer. Then it increments the number of unread items and unlocks the mutex (in case an exception is thrown before the mutex is unlocked, the mutex is unlocked automatically by the destructor of the scoped_lock). At last the method notifies one of the consumer threads waiting for a new item to be inserted into the buffer. The pop_back() method is called by the consumer thread in order to read the next item from the buffer. The method locks the mutex and waits until there is an unread item in the buffer. If there is at least one unread item, the method decrements the number of unread items and reads the next item from the circular_buffer. Then it unlocks the mutex and notifies one of the producer threads waiting for the buffer to free a space for the next item. The pop_back() method does not remove the item but the item is left in the circular_buffer which then replaces it with a new one (inserted by a producer) when the circular_buffer is full. This technique is more effective than removing the item explicitly by calling the pop_back() method of the circular_buffer. This claim is based on the assumption that an assignment (replacement) of a new item into an old one is more effective than a destruction (removal) of an old item and a consequent inplace construction (insertion) of a new item. The circular_buffer is defined in the file boost/circular_buffer.hpp. There is also a forward declaration for the circular_buffer in the header file boost/circular_buffer_fwd.hpp. T The type of the elements stored in the circular_buffer. The T has to be SGIAssignable (SGI STL defined combination of Assignable and CopyConstructible). Moreover T has to be DefaultConstructible if supplied as a default parameter when invoking some of the circular_buffer's methods e.g. insert(iterator pos, const value_type& item = value_type()). And EqualityComparable and/or LessThanComparable if the circular_buffer will be compared with another container. Alloc The allocator type used for all internal memory management. The Alloc has to meet the allocator requirements imposed by STL. value_type The type of elements stored in the circular_buffer. pointer A pointer to an element. const_pointer A const pointer to the element. reference A reference to an element. const_reference A const reference to an element. allocator_type The type of an allocator used in the circular_buffer. const_iterator A const (random access) iterator used to iterate through the circular_buffer. iterator A (random access) iterator used to iterate through the circular_buffer. const_reverse_iterator A const iterator used to iterate backwards through a circular_buffer. reverse_iterator An iterator used to iterate backwards through a circular_buffer. Create an empty circular_buffer with zero capacity. Since Boost version 1.36 the behaviour of this constructor has changed. Now the constructor does not allocate any memory and both capacity and size are set to zero. Also note when inserting an element into a circular_buffer with zero capacity (e.g. by push_back(const_reference) or insert(iterator, value_type)) nothing will be inserted and the size (as well as capacity) remains zero. You can explicitly set the capacity by calling the set_capacity(capacity_type) method or you can use the other constructor with the capacity specified. Create an empty circular_buffer with the specified capacity. The maximum number of elements which can be stored in the circular_buffer. Create a full circular_buffer with the specified capacity and filled with n copies of item. The number of elements the created circular_buffer will be filled with. The element the created circular_buffer will be filled with. Create a circular_buffer with the specified capacity and filled with n copies of item. 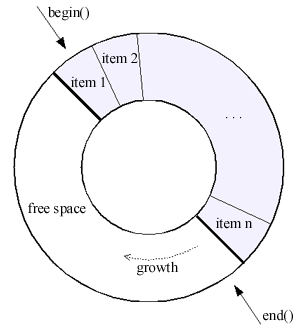 The capacity of the created circular_buffer. Creates a copy of the specified circular_buffer. The circular_buffer to be copied. Create a full circular_buffer filled with a copy of the range. Create a circular_buffer with the specified capacity and filled with a copy of the range. If the number of items to be copied from the range [first, last) is greater than the specified buffer_capacity then only elements from the range [last - buffer_capacity, last) will be copied. Linear (in std::distance(first, last); in min[capacity, std::distance(first, last)] if the InputIterator is a RandomAccessIterator). Invalidates all iterators pointing to the circular_buffer (including iterators equal to end()). Constant (in the size of the circular_buffer) for scalar types; linear for other types. Constant (in the size of the circular_buffer). get_allocator() for obtaining an allocator reference. A reference to the allocator. This method was added in order to optimize obtaining of the allocator with a state, although use of stateful allocators in STL is discouraged. Get the iterator pointing to the beginning of the circular_buffer. A random access iterator pointing to the first element of the circular_buffer. If the circular_buffer is empty it returns an iterator equal to the one returned by end(). Get the iterator pointing to the end of the circular_buffer. A random access iterator pointing to the element "one behind" the last element of the circular_buffer. If the circular_buffer is empty it returns an iterator equal to the one returned by begin(). Get the const iterator pointing to the beginning of the circular_buffer. A const random access iterator pointing to the first element of the circular_buffer. If the circular_buffer is empty it returns an iterator equal to the one returned by end() const. Get the const iterator pointing to the end of the circular_buffer. A const random access iterator pointing to the element "one behind" the last element of the circular_buffer. If the circular_buffer is empty it returns an iterator equal to the one returned by begin() const const. Get the iterator pointing to the beginning of the "reversed" circular_buffer. A reverse random access iterator pointing to the last element of the circular_buffer. If the circular_buffer is empty it returns an iterator equal to the one returned by rend(). Get the iterator pointing to the end of the "reversed" circular_buffer. A reverse random access iterator pointing to the element "one before" the first element of the circular_buffer. If the circular_buffer is empty it returns an iterator equal to the one returned by rbegin(). Get the const iterator pointing to the beginning of the "reversed" circular_buffer. A const reverse random access iterator pointing to the last element of the circular_buffer. If the circular_buffer is empty it returns an iterator equal to the one returned by rend() const. Get the const iterator pointing to the end of the "reversed" circular_buffer. A const reverse random access iterator pointing to the element "one before" the first element of the circular_buffer. If the circular_buffer is empty it returns an iterator equal to the one returned by rbegin() const. Get the element at the index position. A reference to the element at the index position. A const reference to the element at the index position. std::out_of_range when the index is invalid (when index >= size()). A reference to the first element of the circular_buffer. A reference to the last element of the circular_buffer. A const reference to the first element of the circular_buffer. A const reference to the last element of the circular_buffer. Get the first continuous array of the internal buffer. where |a|b|c|d| represents the "array one", |e|f|g| represents the "array two" and | | | | is a free space. Since the complexity of array_one() and array_two() methods is constant the first option is suitable when calling the write method is "cheap". On the other hand the second option is more suitable when calling the write method is more "expensive" than calling the linearize() method whose complexity is linear. The array range of the first continuous array of the internal buffer. In the case the circular_buffer is empty the size of the returned array is 0. In general invoking any method which modifies the internal state of the circular_buffer may delinearize the internal buffer and invalidate the array ranges returned by array_one() and array_two() (and their const versions). In the case the internal buffer is linear e.g. |a|b|c|d|e|f|g| | | | the "array one" is represented by |a|b|c|d|e|f|g| and the "array two" does not exist (the array_two() method returns an array with the size 0). Get the second continuous array of the internal buffer. This method in combination with array_one() can be useful when passing the stored data into a legacy C API as an array. The array range of the second continuous array of the internal buffer. In the case the internal buffer is linear or the circular_buffer is empty the size of the returned array is 0. This method in combination with array_two() const can be useful when passing the stored data into a legacy C API as an array. array_two() const; array_one() for more details how to pass data into a legacy C API. This method in combination with array_one() const can be useful when passing the stored data into a legacy C API as an array. Linearize the internal buffer into a continuous array. This method can be useful when passing the stored data into a legacy C API as an array. A pointer to the beginning of the array or 0 if empty. Basic; no-throw if the operations in the Throws section do not throw anything. Invalidates all iterators pointing to the circular_buffer (except iterators equal to end()); does not invalidate any iterators if the postcondition (the Effect) is already met prior calling this method. Linear (in the size of the circular_buffer); constant if the postcondition (the Effect) is already met. In general invoking any method which modifies the internal state of the circular_buffer may delinearize the internal buffer and invalidate the returned pointer. true if the internal buffer is linearized into a continuous array (i.e. the circular_buffer meets a condition &(*this) < &(*this) < ... < &(*this)[size() - 1]); false otherwise. Rotate elements in the circular_buffer. A more effective implementation of std::rotate. new_begin is a valid iterator pointing to the circular_buffer except its end. Basic; no-throw if the circular_buffer is full or new_begin points to begin() or if the operations in the Throws section do not throw anything. If m < n invalidates iterators pointing to the last m elements (including new_begin, but not iterators equal to end()) else invalidates iterators pointing to the first n elements; does not invalidate any iterators if the circular_buffer is full. Linear (in (std::min)(m, n)); constant if the circular_buffer is full. Get the number of elements currently stored in the circular_buffer. The number of elements stored in the circular_buffer. Get the largest possible size or capacity of the circular_buffer. (It depends on allocator's max_size()). The maximum size/capacity the circular_buffer can be set to. true if there are no elements stored in the circular_buffer; false otherwise. true if the number of elements stored in the circular_buffer equals the capacity of the circular_buffer; false otherwise. Get the maximum number of elements which can be inserted into the circular_buffer without overwriting any of already stored elements. Get the capacity of the circular_buffer. Change the capacity of the circular_buffer. If the current number of elements stored in the circular_buffer is greater than the desired new capacity then number of [size() - new_capacity] last elements will be removed and the new size will be equal to new_capacity. Invalidates all iterators pointing to the circular_buffer (except iterators equal to end()) if the new capacity is different from the original. Change the size of the circular_buffer. If the new size is greater than the current size, copies of item will be inserted at the back of the of the circular_buffer in order to achieve the desired size. In the case the resulting size exceeds the current capacity the capacity will be set to new_size. Invalidates all iterators pointing to the circular_buffer (except iterators equal to end()) if the new size is greater than the current capacity. Invalidates iterators pointing to the removed elements if the new size is lower that the original size. Otherwise it does not invalidate any iterator. Linear (in the new size of the circular_buffer). If the current number of elements stored in the circular_buffer is greater than the desired new capacity then number of [size() - new_capacity] first elements will be removed and the new size will be equal to new_capacity. If the new size is greater than the current size, copies of item will be inserted at the front of the of the circular_buffer in order to achieve the desired size. In the case the resulting size exceeds the current capacity the capacity will be set to new_size. Makes this circular_buffer to become a copy of the specified circular_buffer. Invalidates all iterators pointing to this circular_buffer (except iterators equal to end()). Assign n items into the circular_buffer. The content of the circular_buffer will be removed and replaced with n copies of the item. The number of elements the circular_buffer will be filled with. The element the circular_buffer will be filled with. Invalidates all iterators pointing to the circular_buffer (except iterators equal to end()). Assign n items into the circular_buffer specifying the capacity. The capacity of the circular_buffer will be set to the specified value and the content of the circular_buffer will be removed and replaced with n copies of the item. Assign a copy of the range into the circular_buffer. The content of the circular_buffer will be removed and replaced with copies of elements from the specified range. Assign a copy of the range into the circular_buffer specifying the capacity. The capacity of the circular_buffer will be set to the specified value and the content of the circular_buffer will be removed and replaced with copies of elements from the specified range. Swap the contents of two circular_buffers. this contains elements of cb and vice versa; the capacity of this equals to the capacity of cb and vice versa. The circular_buffer whose content will be swapped. Insert a new element at the end of the circular_buffer. If the circular_buffer is full, the first element will be removed. If the capacity is 0, nothing will be inserted. Basic; no-throw if the operation in the Throws section does not throw anything. Does not invalidate any iterators with the exception of iterators pointing to the overwritten element. Insert a new element at the beginning of the circular_buffer. If the circular_buffer is full, the last element will be removed. If the capacity is 0, nothing will be inserted. Remove the last element from the circular_buffer. The last element is removed from the circular_buffer. Invalidates only iterators pointing to the removed element. Remove the first element from the circular_buffer. The first element is removed from the circular_buffer. pos is a valid iterator pointing to the circular_buffer or its end. If the circular_buffer is full, the first element will be overwritten. If the circular_buffer is full and the pos points to begin(), then the item will not be inserted. If the capacity is 0, nothing will be inserted. Invalidates iterators pointing to the elements at the insertion point (including pos) and iterators behind the insertion point (towards the end; except iterators equal to end()). It also invalidates iterators pointing to the overwritten element. The number of min[pos - begin(), max[0, n - reserve()]] elements will be overwritten at the beginning of the circular_buffer. Invalidates iterators pointing to the elements at the insertion point (including pos) and iterators behind the insertion point (towards the end; except iterators equal to end()). It also invalidates iterators pointing to the overwritten elements. Linear (in min[capacity(), std::distance(pos, end()) + n]). Consider a circular_buffer with the capacity of 6 and the size of 4. Its internal buffer may look like the one below. The number of min[pos - begin(), max[0, distance(first, last) - reserve()]] elements will be overwritten at the beginning of the circular_buffer. Linear (in [std::distance(pos, end()) + std::distance(first, last)]; in min[capacity(), std::distance(pos, end()) + std::distance(first, last)] if the InputIterator is a RandomAccessIterator). If the circular_buffer is full, the last element will be overwritten. If the circular_buffer is full and the pos points to end(), then the item will not be inserted. If the capacity is 0, nothing will be inserted. Invalidates iterators pointing to the elements before the insertion point (towards the beginning and excluding pos). It also invalidates iterators pointing to the overwritten element. The number of min[end() - pos, max[0, n - reserve()]] elements will be overwritten at the end of the circular_buffer. Invalidates iterators pointing to the elements before the insertion point (towards the beginning and excluding pos). It also invalidates iterators pointing to the overwritten elements. Linear (in min[capacity(), std::distance(begin(), pos) + n]). Linear (in [std::distance(begin(), pos) + std::distance(first, last)]; in min[capacity(), std::distance(begin(), pos) + std::distance(first, last)] if the InputIterator is a RandomAccessIterator). pos is a valid iterator pointing to the circular_buffer (but not an end()). Invalidates iterators pointing to the erased element and iterators pointing to the elements behind the erased element (towards the end; except iterators equal to end()). Invalidates iterators pointing to the erased elements and iterators pointing to the elements behind the erased range (towards the end; except iterators equal to end()). Invalidates iterators pointing to the erased element and iterators pointing to the elements in front of the erased element (towards the beginning). Invalidates iterators pointing to the erased elements and iterators pointing to the elements in front of the erased range (towards the beginning). This method is symetric to the erase(iterator, iterator) method and is more effective than erase(iterator, iterator) if std::distance(begin(), first) is lower that std::distance(last, end()). Remove first n elements (with constant complexity for scalar types). The n elements at the beginning of the circular_buffer will be removed. The number of elements to be removed. Invalidates iterators pointing to the first n erased elements. Constant (in n) for scalar types; linear for other types. This method has been specially designed for types which do not require an explicit destructruction (e.g. integer, float or a pointer). For these scalar types a call to a destructor is not required which makes it possible to implement the "erase from beginning" operation with a constant complexity. For non-sacalar types the complexity is linear (hence the explicit destruction is needed) and the implementation is actually equivalent to rerase(begin(), begin() + n). Remove last n elements (with constant complexity for scalar types). The n elements at the end of the circular_buffer will be removed. Invalidates iterators pointing to the last n erased elements. This method has been specially designed for types which do not require an explicit destructruction (e.g. integer, float or a pointer). For these scalar types a call to a destructor is not required which makes it possible to implement the "erase from end" operation with a constant complexity. For non-sacalar types the complexity is linear (hence the explicit destruction is needed) and the implementation is actually equivalent to erase(end() - n, end()). Remove all stored elements from the circular_buffer. Compare two circular_buffers element-by-element to determine if they are equal. Linear (in the size of the circular_buffers). Compare two circular_buffers element-by-element to determine if the left one is lesser than the right one. Compare two circular_buffers element-by-element to determine if they are non-equal. Compare two circular_buffers element-by-element to determine if the left one is greater than the right one. Compare two circular_buffers element-by-element to determine if the left one is lesser or equal to the right one. Compare two circular_buffers element-by-element to determine if the left one is greater or equal to the right one. lhs contains elements of rhs and vice versa. The circular_buffer whose content will be swapped with rhs. The circular_buffer whose content will be swapped with lhs. Constant (in the size of the circular_buffers). A good implementation of smart pointers is included in Boost. The circular_buffer has a short history. Its first version was a std::deque adaptor. This container was not very effective because of many reallocations when inserting/removing an element. Thomas Wenish did a review of this version and motivated me to create a circular buffer which allocates memory at once when created. The second version adapted std::vector but it has been abandoned soon because of limited control over iterator invalidation. The current version is a full-fledged STL compliant container. Pavel Vozenilek did a thorough review of this version and came with many good ideas and improvements. Also, I would like to thank Howard Hinnant, Nigel Stewart and everyone who participated at the formal review for valuable comments and ideas. #1987 Patch to make circular_buffer.hpp #includes absolute. #1852 Copy constructor does not copy capacity. Changed behaviour of the circular_buffer(const allocator_type&) constructor. Since this version the constructor does not allocate any memory and both capacity and size are set to zero. #1919 Default constructed circular buffer throws std::bad_alloc.